ABOVE: The Chippewa County Economic Development Corporation was on hand in March to celebrate the first shipment to depart the new Fleet Farm Distribution Center at the Lake Wissota Business Park. Much like the awesome Chippewa River – swift, mighty, and always flowing – so too is our local economy. Like the economy itself, the Chippewa County Economic Development Corporation is in a constant state of movement. As Chippewa County’s economy evolves, so too must its primary economic development agency, which is dedicated to attracting new businesses, helping existing businesses prosper, assisting entrepreneurs, and improving the quality of life in the area. In recent years, the Chippewa County EDC put great emphasis on drawing in new businesses, and success came in the shape of Mills Fleet Farm and Star Blends, both of which built new facilities in the Lake Wissota Business Park on the northeast side of Chippewa Falls. By opening a distribution hub for a retail chain and a cattle-feed processing facility, respectively, the two new employers have created over 150 jobs within Chippewa County. But as valuable industrial space fills – only about 60 of the 200 acres within Lake Wissota Business Park remain available – and the labor market tightens, the Chippewa County EDC has again realigned its approach, says Charlie Walker, the agency’s president and CEO. 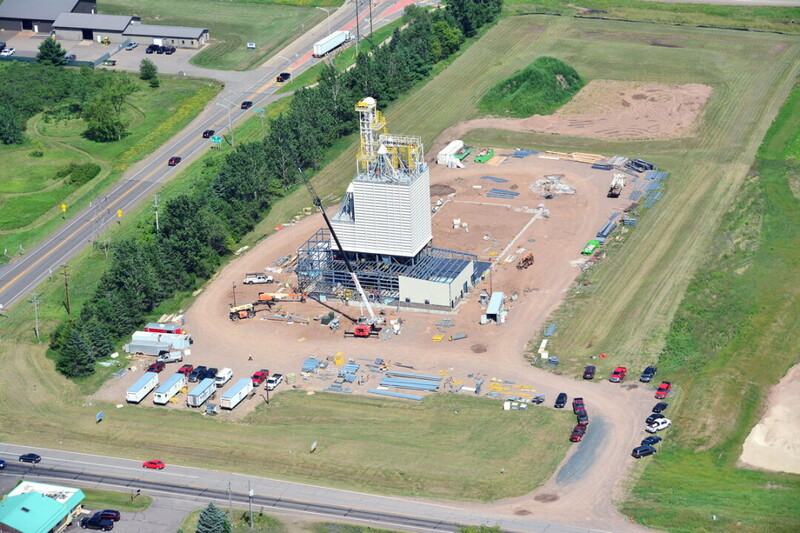 ABOVE: The Star Blends cattle feed facility was under construction last July when this photo was taken. One way of reallocating customers is finding new ones who are willing to pay premium prices for premium products. “Now we’re working on getting our existing businesses to expand in a variety of ways, and that’s where exporting came up,” Walker explains. Pursuing export markets can boost businesses’ bottom lines without requiring them to increase production. Walker said his agency is busy pursuing opportunities for local agricultural and food producers – include cheesemakers, chocolatiers, and distillers – to sell their products overseas. Consumers in markets such as Dubai, Singapore, Hong Kong, and Tokyo are willing to pay higher prices for quality Western goods, and places like the Chippewa Valley are poised to meet their needs. At Catalytic Combustion in Bloomer, Chippewa County has for the first time hosted the ExporTech educational sessions, which are offered by UW-Stout’s Manufacturing Outreach Center. The three-seminar series, which is already underway, is designed to help businesses accelerate their way into the export market. The Chippewa County EDC is slated to hold its 23rd Annual Meeting and Business of the Year Awards Breakfast on Friday, May 18, in the Hawthorne Global Aviation Hanger at the Chippewa Valley Regional Airport, 3800 Starr Ave., Eau Claire. The annual gathering, which begins with coffee and networking at 7am and a breakfast program at 7:30am, features the announcement of awards such as Business of the Year, Entrepreneur of the Year, and Exporter of the Year. Walker said the event offers the organization and its supporters a chance to usher in a new board of directors, celebrate the organization’s accomplishments over the past year, and recognize small businesses that positively move our economy forward. In keeping with that theme, the event’s main speaker, internationally known artist and motivational speaker Richard Hight from Oklahoma, will offer a few valuable lessons about focusing on community strengths and recognizing possibilities, not limitations. He will get the audience to focus on the process – whether in economic development or art – not the finished canvas; he will note that trusting creative impulses can yield surprising and beautiful results. The annual meeting’s location is symbolic as well. While the Chippewa Valley Regional Airport is located within Chippewa County, it’s also inside the city limits of Eau Claire. Increasingly, Walker notes, economic development entities have abandoned parochial turf wars in favor of cooperating across municipal lines. 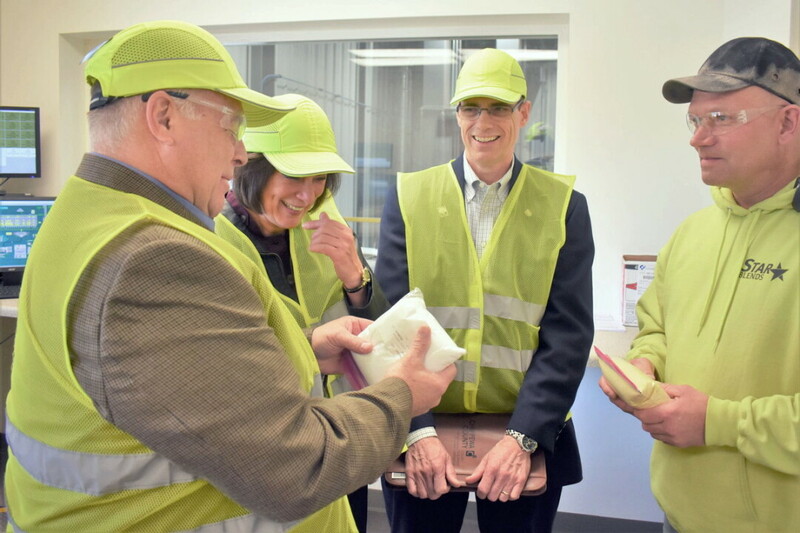 Sheila Harsdorf (second from left), secretary of the state Department of Agriculture, Trade, and Consumer Protection, visited the plant in April. However, as the economy continues to ebb and flow, local economic development organizations can’t afford to rest on their laurels. “Our focus on strategies and tactics go in waves,” Walker says. “We know we have to continually diversify, so any time we can get a new corporate entity to locate here is good, but then we also have to realize that we have some excellent existing businesses, and they are also trying to grow and seek new market share, so we need to help them.” Recruitment efforts, if successful, lead to retention efforts. And retaining businesses requires communities to provide what those businesses – and their employees – need to keep growing. In the case of Chippewa County, one of the things industry needs is more land. “If your existing businesses are successful and need to grow yet they are landlocked, and they want to stay in your community but you don’t have the industrial land space for them, then you are almost in a counterproductive business retention position,” he says. Chippewa County residents will need to look for opportunities to create new industrial parks for the future. In the meantime, the Chippewa County EDC, other economic development entities, and Chippewa Valley businesses are exploring whether there are opportunities for local businesses to become involved in the $10 billion factory that Foxconn Electronics Group plans to build in Racine County. They hope Chippewa Valley firms can play a role by being subcontractors during the plant’s construction or by participating in its supply chain as tier two suppliers. And other economic opportunities abound. Walker said he is interested in whether Chippewa County’s agricultural sector could expand to included industrial hemp, the cultivation of which was recently legalized in Wisconsin. A few farmers in the region have filed for licenses to grow hemp as part of a pilot program. In particular, Walker is interested in whether hemp – which can be used to produce everything from rope to soap to biofuel, and (unlike its cousin, marijuana) isn’t psychoactive – could be cultivated on land reclaimed from frac sand mines. The coming months will also bring opportunities for would-be Chippewa County entrepreneurs to come out of their shells with HATCH, a rotating, high-energy, social networking and idea pitch program. At each HATCH program, individuals or teams of individuals have the opportunity to pitch their brightest business ideas. Both the crowd and a program jury of select entrepreneurs, investors, and community resource partners select the winning idea. HATCH is funded by BrightStar, NEWaukee, and the local economic development organizations of Chippewa, Dunn, and Eau Claire counties. HATCH winners from the June 21 session in Eau Claire, the Aug. 9 event in Menomonie, and the Sept. 27 competition in Chippewa Falls will vie for a $10,000 grand prize in a Nov. 8 regional final. “It’s exciting times in Chippewa County, really, in the Chippewa Valley,” Walker says. This article was produced in partnership with the Chippewa County Economic Development Corporation. To learn more about the EDC and its programs, look for an enhanced version of this article online at VolumeOne.org/ChippewaFalls, or visit the EDC’s website at chippewa-wi.com. You can also find the Chippewa County EDC on Facebook, Twitter, YouTube, and LinkedIn, or reach them by phone at (715) 723-7150, via email at info@chippewa-wi.com, or in person at 770 Technology Way in Chippewa Falls.